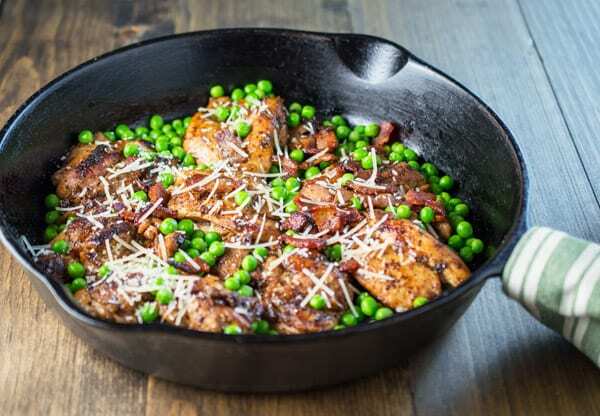 This Balsamic Chicken with Peas and Bacon recipe is a great weeknight meal that comes together in a snap. It is grain free, gluten free, and paleo. This recipe can’t decide if it is French or Italian. Lets call it French/Italian fusion. It has sweet, sour, and savory notes that all play well together. If your kids will eat peas, it is surprisingly kid friendly! My kids went crazy for this and we had no leftovers. Even though peas are technically a legume, they are not dried and are approved on most ancestral diets, (not Whole 30). 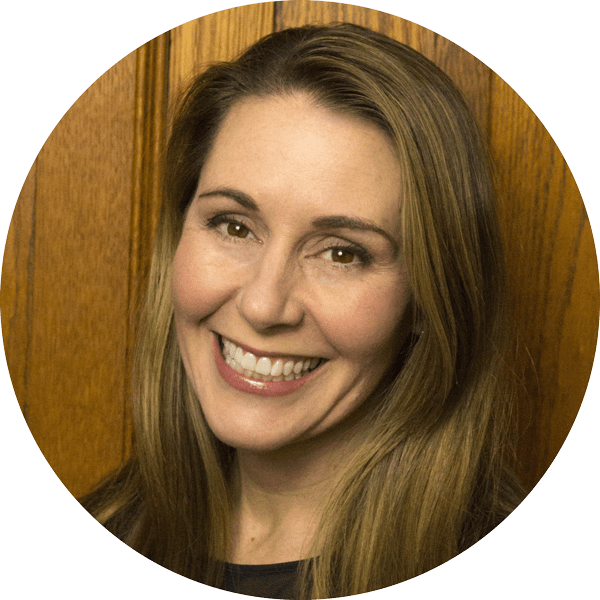 They are low in phytates and lectins, and are easy to digest for most people. If you are watching your carbs, you can just omit the peas, and serve the chicken along side a different green vegetable. For instructions with cooking process photos, scroll past the recipe. Balsamic Chicken with Peas and Bacon. Wash and pat dry chicken thighs. Trim any excess fat and cut them in half. Season chicken with salt and pepper. Cut bacon slices into ½” pieces. In a cast iron skillet, over a medium burner, cook bacon until crisp and remove to drain onto a paper towel lined plate. Pour off bacon grease to a separate container and reserve, (turn off your burner, no grease fires please). Return 2 tsp of bacon grease to the pan. Over a medium burner, brown 4 of the chicken thigh halves in the bacon fat, cooking 3 minutes per side. Remove to a paper towel lined plate. Repeat with remaining 4 chicken thigh halves. Add 2 more tsp of bacon grease to the pan, and sauté the shallot until soft, about 3 minutes. In a separate bowl, whisk together the balsamic vinegar, dijon mustard, maple syrup, chicken broth, and herbs de Provence. Add mixture to the skillet and deglaze the pan. Return chicken thighs to the pan, along with the frozen peas, tossing to coat. Simmer for about 3-4 minutes, or until the chicken is cooked through, the peas are warmed, and the liquid has reduced. Add more chicken stock if necessary. Taste and adjust seasoning. Sprinkle with cooked bacon pieces and garnish with shredded Parmesan cheese.